We heard only one airplane fly overhead in the two weeks that I was finally up the Lomami. John commented on it immediately, “most unusual.” Planes stay away from the central forest between the three rivers. They fly north along the roads and Congo River or south along the savanna roads and forest border, but not over the TL2 where the few old colonial motor tracts are now foot-trails, too overgrown to be visible from above. More importantly, there is NO air strip for an emergency landing, NO open dirt road for the last-chance “soft” crash, nothing. 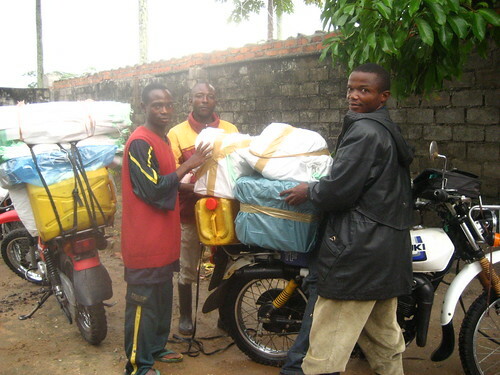 Our drivers (Albert, Nestor and Tipe) readying the motobikes for the first, Kisangani-Opala, section of the trip. The only real highway is the waterway. 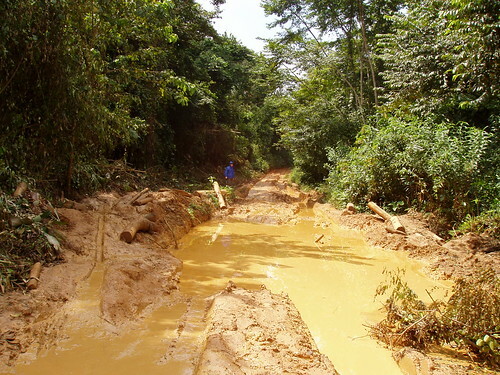 Even the road north of Opala to Kisangani, is barely more than a bicycle trail. 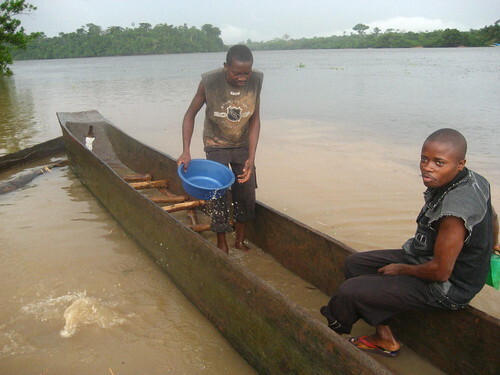 The road itself was the main obstacle during the last 60 km of the return to Kisangani. 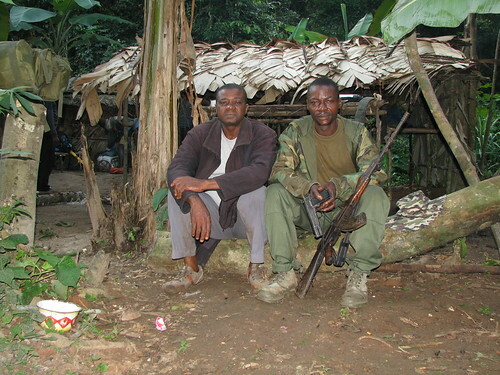 We stuck to Congo’s west bank on the way back and reached Kisangani after 23 hrs. In short, getting to Obenge and back was an adventure, an adventure that helped me to understand just how there can still be so many mysteries hidden in the TL2 forests. 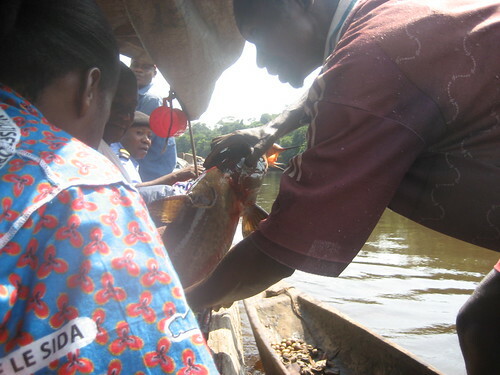 Traveling by road between Kisangani and Opala, river-crossings become major delays. 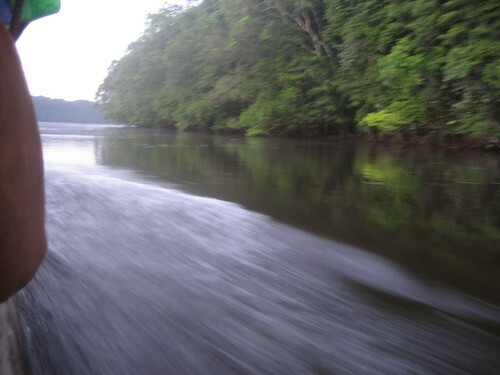 A storm put-off crossing the Tshopo by an hour then the “ferry” needed bailing. After we finally loaded the motobikes into the dugout, the crossing was fast and efficient. This is how we did it: From Kisangani to Opala we took rather unreliable rented AG 100s and 125s. Not much choice!! We started with three but only entered Opala with two as one had a complete breakdown part way through the second day. I was traveling with Ashley and we were bringing gear needed to keep the teams on the ground through June (and coffee and chocolate to John). 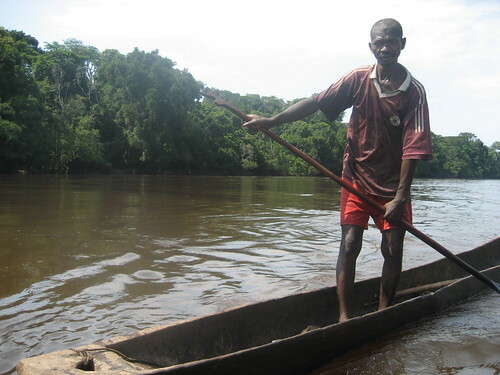 Crossing the huge expanse of the Congo at Yanonge, the helmsman and front paddle were also incredibly rapid and unhesitant. 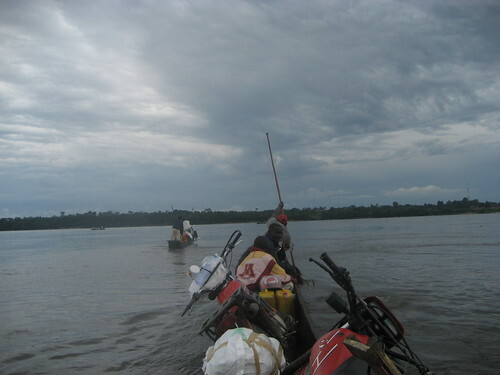 With a combination of breakdowns and many river crossings (Tshopo, then Congo, then Lobaye and finally Lomami) between Kisangani and Opala, it took two days on motorcycle (“moto”). Then, two more days in motorized dugout south from Opala. At the Lobaye River crossing we met some of Major John’s men patrolling bicycle packs to keep munitions from traveling south where they could be used for another elephant slaughter. 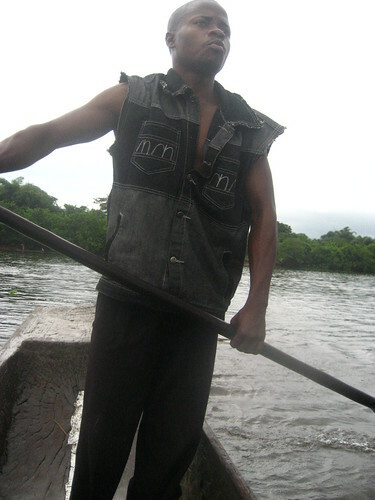 By far the most comfortable part of the travel was on the Lomami River, the dugout south from Opala. Also, the most informative. We were traveling with Madame the Territorial Administrator (A.T.) as well as other dignitaries from Opala. This was an opportunity to discuss at a higher level the pros and cons of conservation in this remote area. We were also providing a means of transport for the A.T. to visit this far flung corner of her territory, an area she had not yet seen but knew as the erstwhile hideout of the infamous Colonel Thoms , the brigand accused of over a hundred rapes in her territory just the year before. He and his men had held Obenge in their grip. The captain for the Armed Forces posted in Opala accompagnied the A.T. as her bodyguard. Despite the appearance of shock-trooper he was the most enthusiastic natural history observer in the delegation. There were particular perks in being with the A.T. It definitely gave us a certain status and also (no small thing) gave us access to a share in the gifts of fish, bananas and rice that were showered on her. A local fishermen paddled up with a huge catfish gift for Madame A.T. He then pushed off and continued checking his hooks and lines. We passed scattered fisher families camped in lone shelters on the forested banks, one here and one there, continuously south of Opala. 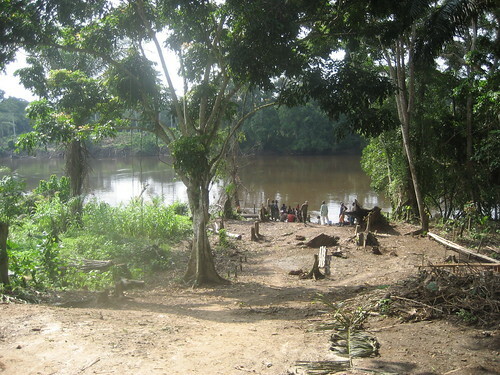 There were very few permanent settlements, even tiny ones, before we reached Obenge. 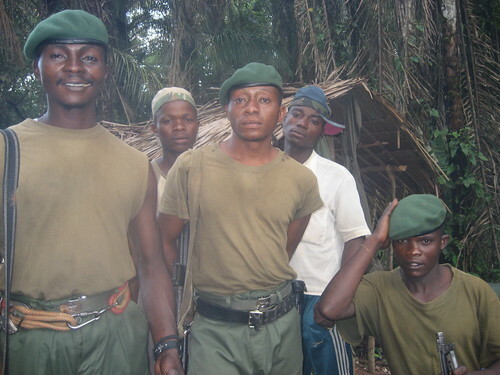 The delivery of coffee and chocolate was finally effected four days after departure from Kisangani. Amidst great celebration of course!! 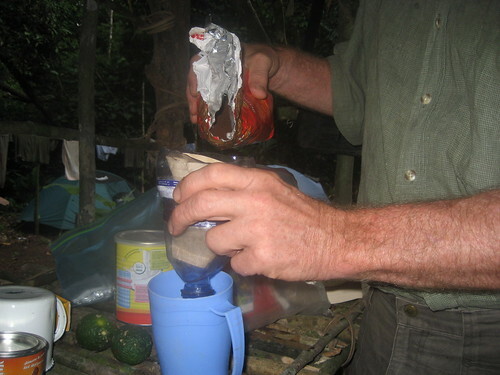 Belgian coffee and a sawed-off plastic water bottle for filter. Result: 4 star. 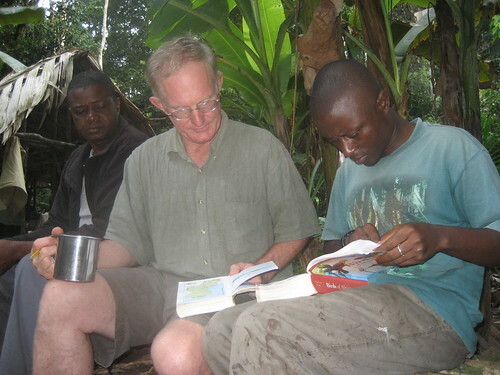 Coffee perched on knee, John works with Muhindo on bird identifications. This entry was written by Terese Hart, posted on 2008-05-24 at 6:11 am, filed under About the project. Bookmark the permalink. Follow any comments here with the RSS feed for this post. Post a comment or leave a trackback: Trackback URL. Wow. That was some 19th-century travel for a 21st century mission. Where did you sleep? or shower? bucket bath on the lucky nights (and two of those travel nights were no supper no bath, and tent up after dark) BUT well worth it!! Those Congolese roads beggar belief! Great road shot Terese – I’ve got a MUCH better picture of your moto trips with Ash now!! Now,people believe me when I tell them about the roads.I haven’t had a good picture to show friends and family.But the story that gets the most interest is about the village near Lubumbashi where they keep a hole dug so trucks will need to hire help to get out or around the holes.